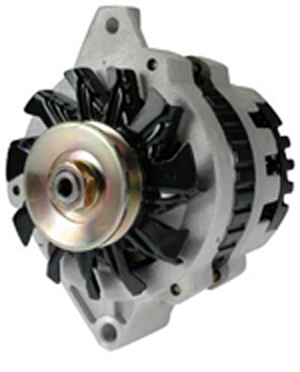 Our small case alternator is a great choice for tight areas where minimal space is an issue or as a higher output replacement for 1963 - 1992 vehicles. It is available in a number of mounting ear configurations shown below. This is a GM CS-130 Series Alternator. It will plug in to most OEM wiring harnesses for GM vehicles from 1987 - 1992. Please email your questions concerning applications to us and we will respond quickly. We build these units to provide 85 amps and up at an idle. That's as much as the original units put out at high RPM. 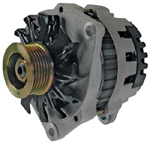 This high output alternator can be used to replace a number of original GM externally and internally regulated alternators from 1963 through 2002 year models. This is perfect for street rods and project cars. You can also purchase this same unit as a 1-Wire, requiring only the battery cable to be hooked up at the output post of the alternator. Choose which mounting style you need for your application from the choices below. Need more amperage than this alternator can provide? CLICK HERE to see our Mega Amp alternators that are direct replacements for these units. See our brackets section for special brackets to use this high output alternator as an upgrade or conversion to replace GM and Dodge generators, flathead Ford generators, and Chrysler alternators.